Kenya´s Keroche Breweries heiress, Anerlisa Muigai seems entangled with facts about her weight loss journey. The gamble First, it was 10 years back, but now, it is 5 years back. If anything, years should actually be adding up if at all she is growing older. Fine, she never underwent surgery for weight loss, good for her, but could she at the very least just get her facts right on how long back? Basing on her post, she definitely seems irritated by people who keep following her up about her weight loss journey. She felt she needed to share her weight loss journey, because perhaps, it would aid somebody else. But whoop! fans got her wrong. However, according to her previous posts that have since then be deleted, the math just doesn´t add up right. To answer the question of how many years I have struggled with my weight, it is actually 10 years. I started caring less about what I ate. So to explain the 1st picture, I lost all the weight (35kgs) in just 3 months. I was on a strict vegan and juicing diet which I later found was unrealistic and that is the reason I added all the weight back. Anerlisa Muigai in a previous post So, the above photo was shared in 2018, which Anerlisa captioned ¨7 Years Ago¨. That is fine but apparently, as we speak, she talks of 5 years down the line, recounting her weight loss journey. So, which is which Anerlisa? Question is, when exactly did she gain her weight because we now have 5 years, 7 years and 10 years…and still counting. 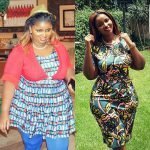 The post Caught pants down: Who are your sources Anerlisa Muigai when it comes to recounting your weight loss journey? appeared first on Ghafla! Kenya.